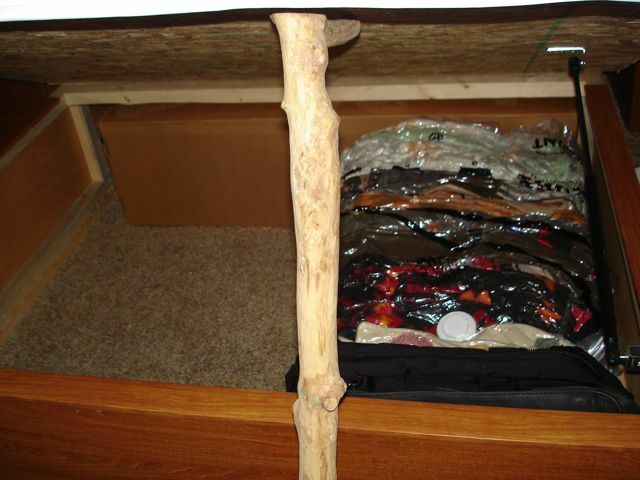 Here is a photo of my under bed storage space which was filled with my collection of wool blankets. I really needed more space so I decided to invest in the "Space Bag" and using my central vacuum I more than doubled my available storage space! (A Caveat thought: Remember, more stuff weighs more, so don't get carried away stuffing tons of stuff in your storage, even blankets can add up! Also, the bags I bought were rather fragile, I somehow managed to put a hole in one already that I'm going to try and patch with an airbed patch kit, so be careful moving the bags around after filling). Our cat keeps sneaking under the bed everytime I open it, one night we heard her meowing and it took a while to find out where she is, she often hides in any open cupboard too....have shut her in many times. So far she's left the plastic alone, but I'm sure she'll take up the bad habit if she knows it annoys me!